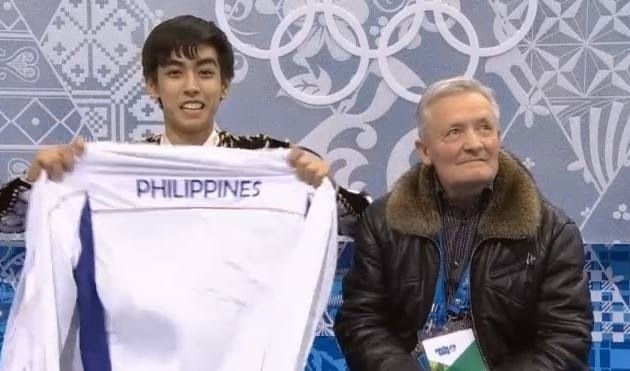 This is Michael Christian Martinez, the lone representative of the Philippines to the Sochi Winter Olympics. Last night he performed his heart out and qualified to skate during the Men’s Freestyle Finals today, Friday. His story is one for the books: he overcame his childhood asthma by getting into figure ice skating. There are only 3 ice skating rinks in this country, all of which are found inside a chain of malls. The right people saw his potential and encouraged his mom to send him to the US to hone his craft there. The mom agreed and said that she would rather spend their money on his training than on his medical bills. He qualified to join the Olympics without the help of the Philippine Government. His family pooled some money to send him to Sochi: they mortgaged their home and got some funding from the chain of malls where the ice skating rinks are. We did not know of his existence until about three weeks ago. He quietly and steadily worked his way to the top without noise and fanfare. And now he’s in the top 24. In the world! Cliché as this may sound, win or lose, this 17 year old is already a champ. A special shout out goes to his family, especially his mom. This is the kind of love that I would like to celebrate this Valentine’s Day. Congratulations, Michael! Shine bright tonight!